The all singing all dancing robotic toys of today are mini marvels of modern technology but every grown up can remember the robot toys and games they played with as a child, prepare yourself for a massive dose of nostalgia as we transport you back in time with our collection of classic robot toys from the 50′, 60’s and 70’s. What these vintage robot toys lack in sophistication they more than make up for with originality and a quirky charm that can still fascinate the most hi-tech kid’s of today, some have even become major collectors items in their own right, as they become harder and harder to get hold of and are well worth investing in. 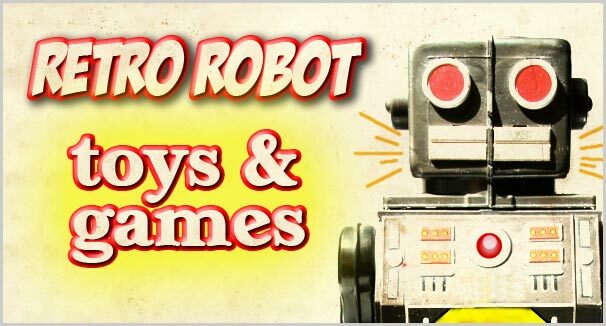 So drag the kids away from their games consoles, laptop’s and tablets and have some good old fashioned family fun with some good old fashioned retro robot toys. 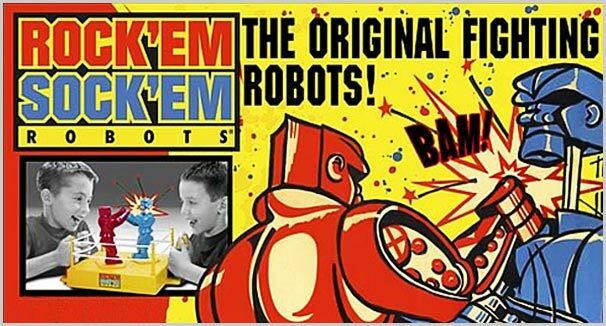 If you did your growing up in the 1960’s or 1970’s it is almost certain that at some point you will have played Rock ‘Em Sock ‘Em Robots, (or Raving Bonkers as it was referred to in the UK), the fast paced robot battling game originally produced in 1964 by the Marx toy company. Designed by Marvin Glass and Associates, the game featured two robot boxers, in the blue corner was the Blue Bomber and wearing red his adversary the Red Rocker, players could move their fighter around the ring and throw punches by manipulating levers and pressing buttons to throw left and right uppercuts. The game became a major sensation on both sides of the Atlantic selling in the hundreds of thousands and still enjoys cult pop icon status today. Amazingly it is still in production, being manufactured this time around by Mattel and a whole new generation of kids are attempting to ” knock his block off “. 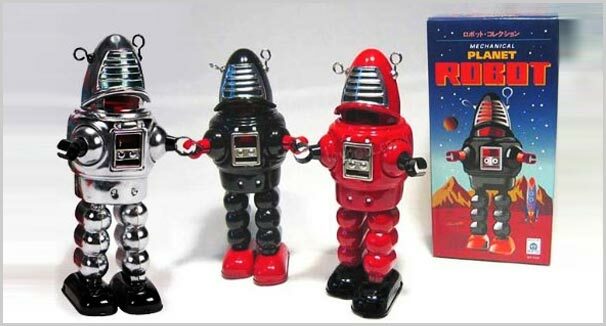 We would not recommend this vintage tin robot as a plaything for younger children, as it does not comply with modern toy manufacturing regulations, however the sparking, wind up robot by Mechanical Planet makes a great collectable gift for older children, including young at heart Dad’s and Granddad’s. Loosely based on Robbie the Robot from the classic fifties sci-fi movie Forbidden Planet this impressive model walks (or more precisely, shuffles) while emitting fearsome sparks, which can be observed through his visor and transparent chest panel. This highly desired vintage tin toy is packaged in a retro designed box, to complete the classic fifties look and makes a great gift for all vintage robot fans and collectors everywhere. 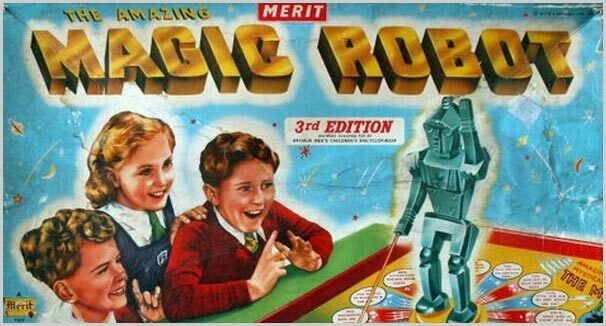 Still capable of amazing young children, The Amazing Magic Robot Game is a board game featuring a robotic quiz master. 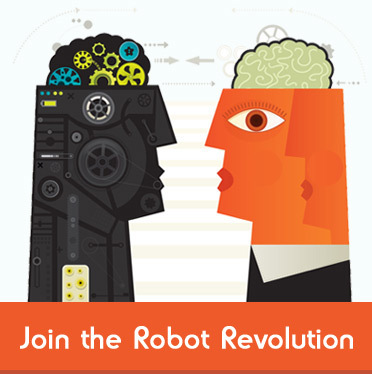 You simply point the robot at a question and when you place him at the answers section he will magically rotate and point at the correct result, time after time. A classic piece of nostalgia from the 1950’s and to this day no one has ever figured out how he does it, could it be magnets or simply magic, baffle the kid’s with a vintage board game that everyone will love. 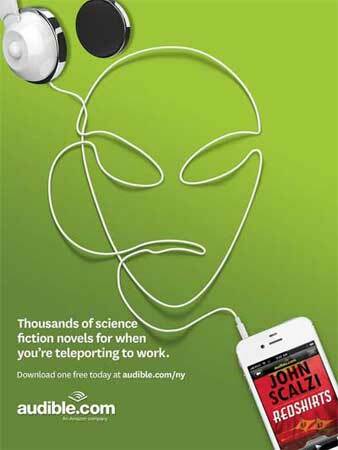 Produced by Irwin Allen, Lost in Space was the iconic television series from the 1960’s featuring corny plots, cheesy acting and one of the best science fiction robots ever, the Class M-3 Model B9 robot, who was never officially named but uttered such classic lines as “Danger, Danger Will Robinson”, “Does not Compute” and the ever present “Warning, Warning”. 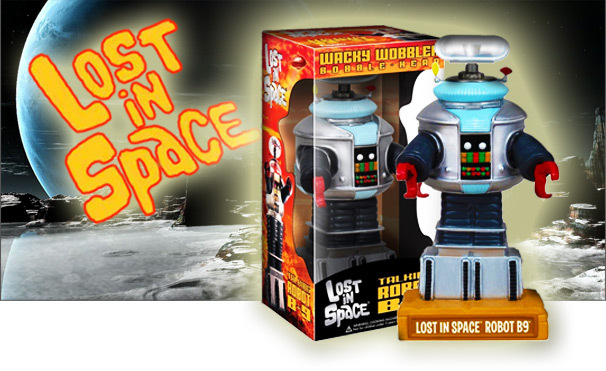 This amazing robot has now been immortalised forever with this stunning talking ‘Bobblehead’ from Funko, relive your misspent youth with this must have collectable, ideal for any robot collector or Lost in Space fan.